196 pages | 4 B/W Illus. Providing an ethnographic account of the Islamic Party of Malaysia (PAS) and its Youth Wing (Dewan Pemuda PAS), this book analyses the genesis and role of Islamic movements in terms of their engagement in mainstream politics. 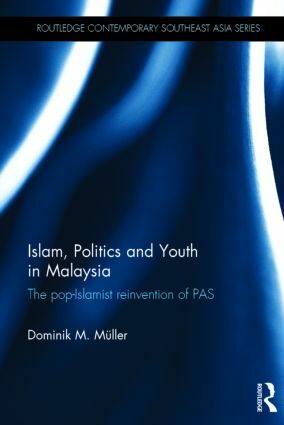 It explores the party’s changing approach towards popular culture and critically investigates whether the narrative of a post-Islamist turn can be applied to the PAS Youth. The book shows that in contrast to the assumption that Islamic marketization and post-Islamism are reinforcing each other, the PAS Youth has strategically appropriated and integrated Islamic consumerism to pursue a decidedly Islamist – or ‘pop-Islamist’ – political agenda. The media-savvy PAS Youth elites, which are at the forefront of implementing new outreach strategies for the party, categorically oppose tendencies of political moderation among the senior party. Instead, they are most passionately calling for the establishment of a Syariah-based Islamic oder for state and society, although these renewed calls are increasingly expressed through modern channels such as Facebook, YouTube, rock music, celebrity advertising, branded commodities and other market-driven forms of social movement mobilization. A timely and significant contribution to the literature on Islam and politics in Malaysia and beyond, this book sheds new light on widespread assumptions or even hopes of "post-Islamism". It is of interest to students and scholars of Political Religion and Southeast Asian Politics. Dominik Muller is a postdoctoral fellow in political and legal anthropology at Goethe-University Frankfurt, Germany. He has held fellowships and visiting positions at Stanford University, the University of Brunei Darussalam, and the University of Oxford.